CEO Carlos Ghosn says Renault's product offensive is paying off. PARIS -- Renault today said it is targeting further sales and earnings improvement this year after strong European deliveries of its low-cost Dacia cars and small SUVs helped to more than tripled 2014 profit. The automaker's net income jumped to 1.89 billion euros ($2.14 billion) last year from 586 million in 2013 despite a deepening market slump in Russia. Revenue edged 0.3 percent higher to 41.06 billion euros, the company said in a statement. Operating profit rose almost 30 percent to 1.61 billion euros, lifting the company's operating margin to 3.9 percent from 3 percent, with profitability at the core automotive division rising in step. 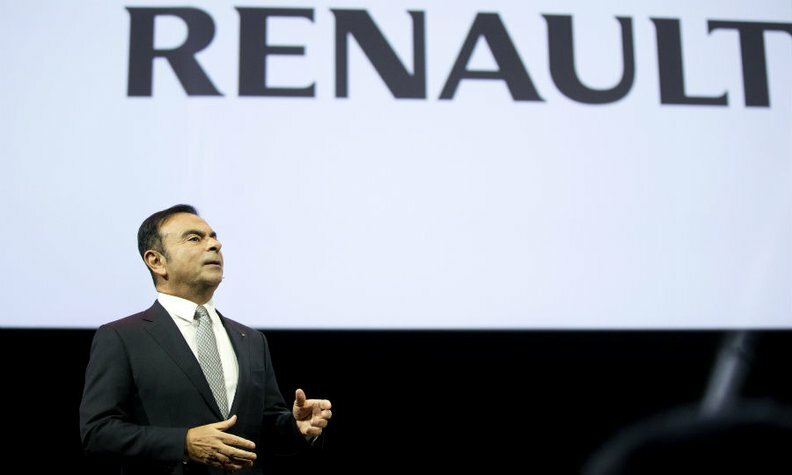 CEO Carlos Ghosn credited an "unprecedented product offensive" for Renault's full-year performance, adding in the statement that it "positions us on track to achieve our strategic plan." Arndt Ellinghorst, a London-based analyst at Evercore ISI, said: “There was no major negative surprise, as the market feared.” He said Ghosn's forecast for the year should relieve the fears of Renault’s exposure to Russia. Renault's numbers amounted to "a strong set of earnings considerably above expectations despite weakness in key emerging markets," Citi analyst Philip Watkins said. Automotive operating profit rose by 363 million euros to 858 million euros, representing 2.2 percent of revenues. Cost reductions and sales growth helped to offset unfavorable foreign exchange rates, Renault said. The auto division's contribution to revenues amounted to 38.87 billion euros, up 0.3 percent. Renault said it offset negative currency variations by increasing prices outside Europe and by the strong growth of sales to partners. Automotive operational free cash flow was positive at 1.08 billion euros, due to the increase in profitability, as well as a positive change of 596 million euros in the working capital requirement, Renault said. At its next shareholder meeting, Renault plans to recommend increasing its annual dividend to 1.90 euros per share from 1.72 euros the previous year. The group's European sales were boosted in 2014 by new Renault models including the Captur subcompact SUV and revamped Clio subcompact car, as well as the low-cost Dacia brand. The rollout of new models continues in 2015 with an update to the large Espace large minivan, which has been revamped with crossover styling, followed by the Kadjar compact SUV and a replacement for the midsize Laguna sedan. Forecasting a 2 percent increase in global auto production this year, Renault pledged to increase deliveries and revenue before currency effects and further increase profitability at the group and auto-division levels, with positive cash flow at the core manufacturing division. Renault's sales push outside of Europe fell flat last year because of economic woes in Russia, Brazil and Argentina. The company, which owns 43 percent of Nissan, is sticking to a strategy of expanding in emerging markets, with plans to introduce an ultra-low-cost vehicle in India this year and preparations to start building cars in China in 2016. Ghosn today said that Renault targets a 3 percent market share in China, or 600,000 annual vehicle sales, up from about 30,000 now. Renault’s global deliveries rose 3.2 percent last year to 2.71 million vehicles, with sales of no-frills autos, including the Europe-focused Dacia brand, jumping 5.3 percent to 1.14 million. To underpin its growth, Renault plans to hire 1,000 people in France this year. Ghosn aims to lift Renault and its partner, Nissan, to become one of the top three global automakers from its No. 4 position now. The company targets a return on sales exceeding 5 percent by 2016 and 50 billion euros in annual revenue in the midterm. Ghosn is pushing for more cooperation between the alliance partners and targets joint annual savings of more than 5 billion euros in 2016, up from a previous target of 4.3 billion euros, he said today on conference call. Nissan contributed 1.56 billion euros to Renault’s profit last year. Economic and political crises in Russia, Renault’s third-largest global market, may continue to affect the French company’s growth strategy outside of Europe. Renault's losses at Russian automaker AvtoVAZ, which it controls indirectly with Nissan, widened to 182 million euros last year from 34 million in 2013. The carmaker and Nissan jointly own a majority stake in Lada maker AvtoVAZ. Renault-Nissan and AvtoVAZ are targeting a combined market share of 40 percent in Russia by 2016. The manufacturers accounted for 31 percent of Russia’s car and light commercial vehicle sales in 2014. Renault shares rose as much as 8.4 percent to 75.00 euros, the biggest gain since October 2012, and were up 7.2 percent at 9:09 a.m. in Paris trading. The stock has climbed 23 percent this year, valuing the company at 22 billion euros.